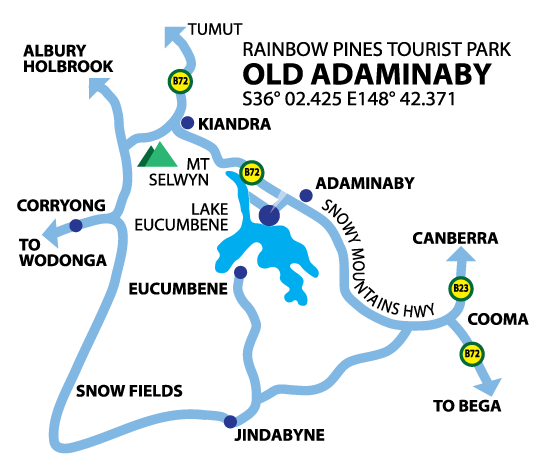 Rainbow Pines Tourist Caravan Park sites on the shores of beautiful Lake Eucumbene only 40 minutes to Selwyn Snowfields with the breathtaking Snowy Mountains as its backrdrop. You can relax on the verandah of our deluxe cabin or sit under a tree in our camping sites and feed the wild birds or catch a gilmpse of a wallaby or echidna. Best of all you can kick back and leave the city miles away to RELAX. Resident Lessees Rick and Kerry welcome you to the Award winning Rainbow Pines Tourist Caravan Park. A Tourist Park only 40 mins from Selwyn Snowfields with breathtaking scenery and an emphasis on family holiday enjoyment. A HEATED amenity block with disabled/family room facilities. The Onsite shop is stocked with basics such as bread, milk, bacon, butter, etc and a lot more to make a meal. The shop also has a large collection of fishing tackle and bait ranging from hooks up to complete trout combo's from Abu Garcia. We also sell and services STORMRIDER and STORMY inflatable life jackets.